Posted on 1/3/2008, 2:26 am, by Colin Charles, under General. Today, I decided to start a FriendFeed account (I’m byte there). The first question that came to my mind was, how is this any better or different from Mugshot? I first found out about it, through Jeremy Zawodny’s blog post. He mentioned he liked the fact that people could comment on activities. I see this as no different to how people can have conversations within Mugshot (also known as quips). And with the Mugshot client, these comments tend to become interactive, so it starts becoming an immediate conversation with people that are around. The striking similarity, between what FriendFeed offers (basically, a combination of all your feeds, with the ability to get comments on feeds, which promotes a conversation/social network kind of feel to it) is pretty much what Mugshot has been offering, with a desktop client (albeit, only on Windows and Linux). Mugshot’s desktop client can even be used as a Facebook Notifier, of sorts (when you get a message, you get notified by the client). Hmm. Almost no difference, right? Now, you’re wondering if you can have a conversation? Yes, yes, you can as I said earlier, thanks to the idea of quips. Notice that I was the only one online, for the group. If more were online, within that group, there could have been a bit of a chat, similar to what you get on IRC. Wow, so Mugshot allows you to group your friends. Not something I found, easily with FriendFeed. What FriendFeed does, that Mugshot doesn’t do? Recommend new friends you might want to keep track of, i.e. folk that are popular among your friends. Honestly, the recommendations are nice (it recommended me to read Robert Scoble, for instance), but if FriendFeed wasn’t aiming to be a social networking tool, why bother with recommendations? So, what made FriendFeed get money, in their recent Series A round? Could it be the strong recommendation by early Googlers? Early Gmail team members like Paul Buchheit and Sanjeev Singh, and some Google Maps engineers are on board, so do VCs see this as something big waiting to happen? Maybe I’m missing something, unique and original, that FriendFeed has over Mugshot. I’ve tried reading a review on it, and still can’t see the value of yet another “life stream”. Wait, I found it. It might be the stats that FriendFeed offers. It looks strinkingly similar to what Google Trends (in their Reader even), shows – people you find interesting, top sites used by your friends, my top sites, and so on… But really, doesn’t stats just wear out? How often do you look at your Google Reader Trends? Or Google Web History? Probably not a lot. I think it all boils down to bad marketing/community creation from the Red Hat folk. Mugshot has been around for a substantial amount of time. The source code has been public as well. 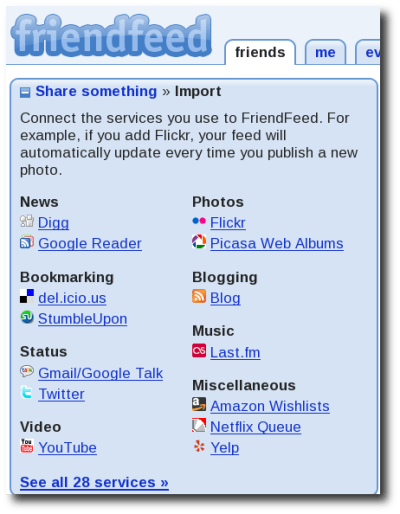 The idea of tying it with the online desktop (in fact, nowadays, a lot of Mugshot is running at online.gnome.org, pushing the GNOME Online Desktop) is a good one, but should not have been the only focus. Leaving it for the Linux geeks only, in general, might be a big mistake – a Mac OS X client should have been priority one, as OS X users seem to be early adopters. With Havoc having left to start LiTL, I do wonder if the online desktop, social networking site, Mugshot will continue getting the pushing that it needs. Besides, Mugshot is filled with nothing but good ideas. It would be a shame to not see more good work and community acceptance and take up of Mugshot. I for one am planning on staying loyal to Mugshot. I too am a loyal Mugshot user and to me FriendFeed offers no compelling reason to leave. That and the native Linux client for Mugshot is great. The problem with MugShot is that it’s a one-end pipe at this stage: you can pipe a lot of things in but almost cannot pipe anything out. I prefer to keep up to date with my rss reader. You can subscribe your friends’ friendfeed easily. But MugShot, no way. accroding to http://developer.mugshot.org/wiki/API, you can only get information on the current song someone is listening to. Anyway, MugShot has a nice client, and both client and server is open source.